Don’t waste too many stones on one bird. The Bluethroat (Luscinia svecica), is a small passerine bird that was formerly classed as a member of the thrush family Turdidae, but is now more generally considered to be an Old World flycatcher, Muscicapidae. 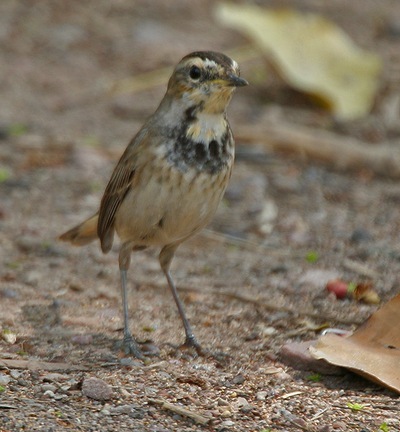 Bluethroat (female): Have you seen this bird? The male Bluethroat is instantly identifiable. Females and immatures can be indentified by their white throats, dark breast bands and rust patches in the tail. Bluethroats are a migratory insectivorous species breeding in wet birch wood or bushy swamp in Europe and Asia with a foothold in western Alaska. It winters in north Africa and India. The Bluethroat nests in tussocks or low in dense bushes. Bluethroats are, generally speaking, skulking birds, keeping to the ground or near it in the cover of vegetation, but will come out to feed in the open when undisturbed. In their winter quarters Bluethroats are solitary in habits and retain that attachment to cover near water and in swampy places that is observable on the breeding ground. Bird, birds, Bluethroat, Bluethroats, Luscinia svecica, old proverb, passerine bird, Stone, Turdidae. Bookmark.